The threat of terrorism is at "its most heightened state" since the 9/11 attacks nearly a decade ago, U.S. 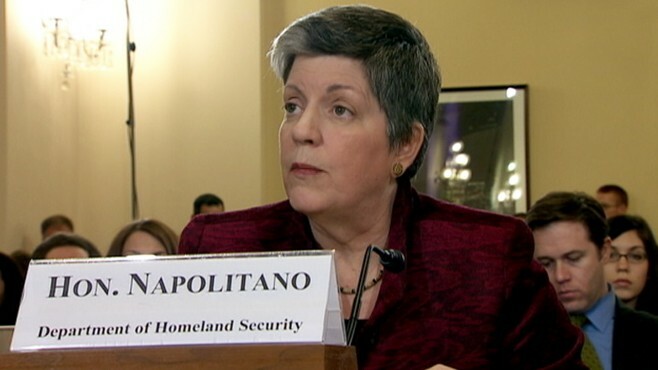 Homeland Security Secretary Janet Napolitano said today. "The terrorist threat facing our country has evolved significantly in the last ten years -- and continues to evolve -- so that, in some ways, the threat facing us is at its most heightened state since those attacks," she said before the House Homeland Security Committee. "One of the most striking elements of today's threat picture is that plots to attack America increasingly involve American residents and citizens," Napolitano said, referring to so-called homegrown terrorists fueled by the Internet and connections with operatives overseas. More than two dozen Americans have been arrested on terrorism charges in the past two years, according to government statistics. Fifty individuals involved in 32 high-profile terrorism plots involving al Qaeda-like ideology in the past decade were U.S. citizens at the time of their arrests, according to a study by the New York State Intelligence Center. Most were natural-born. "[We] are now operating under the assumption, based on the latest intelligence and recent arrests, that individuals prepared to carry out terrorist attacks and acts of violence might be in the United States, and they could carry out acts of violence with little or no warning," Napolitano said. Napolitano made the remarks before the House Homeland Security Committee, where she testified with National Counterterrorism Center Director Michael Leiter. "This shift is a game changer," Republican committee chairman Rep. Peter King of New York said. "We must confront this threat." FBI and Justice Department officials have reported a spike in the number of terrorism-related investigations and prosecutions involving U.S. residents since 2009. Many of the suspects -- including Najibullah Zazi, who plotted New York City subway bombings in September 2009, and Faisal Shahzad, the convicted would-be Time Square bomber -- lived and worked for years inside the United States before preparing their attacks. David Headley of Chicago was convicted of a role in the November 2008 Mumbai attacks that killed more than 170 people, and Colleen LaRose, more commonly known as "Jihad Jane," was implicated in a plot to kill a Swedish cartoonist for drawing the head of the Prophet Muhammad on the body of a dog in 2007. Leiter said the evolution of domestic radicalism has been aided by propaganda developed by extremists and pushed on the Internet. "This narrative -- a blend of al Qaeda inspiration, perceived victimization and glorification of past homegrown plotting -- addresses the unique concerns of like-minded, U.S.-based individuals," he said. Homeland security officials said Yemen remains the "battleground" from which al Qaeda operatives are actively planning attacks against the United States, training recruits and coordinating plots. The country is also home to radical Islamic cleric Anwar al Awlaki, a Yemeni-American who has used the Internet to encourage attacks from abroad. Asked by chairman King to compare Osama bin Laden and Awlaki, Leiter said he considers Awlaki and the group al Qaeda in the Arabian Peninsula, which he leads, "probably the most significant risk to the U.S. homeland." Awlaki had ties to the attempted 2009 Christmas day bombing of Northwest flight 253 and last fall's cargo bomb plot, Adam Gadahn, a top propaganda master for al Qaeda, and Omar Hammami, a U.S. citizen from Alabama turned top recruiter and lieutenant in the al Qaeda-linked Al Shabaab terrorist network in Somalia. "He's an extremely dangerous man. He has shown a desire to harm the United States, a desire to strike the homeland of the United States," U.S. Attorney General Eric Holder said in December. "He is a person who -- as an American citizen -- is familiar with this country and he brings a dimension, because of that American familiarity, that others do not." Holder said that as a threat to the United States, Awlaki ranks alongside bin Laden. Napolitano and Leiter sought to reassure members of Congress and the public today that the agencies were actively working to counter the evolving dangers, including Awlaki. Leiter said the agency's new "pursuit groups," created after intelligence officials failed to connect the dots and detect the 2009 Christmas Day bomb plot, have "repeatedly identified key leads that would have otherwise been missed amidst a sea of uncorrelated data." He also said the government has bolstered its terrorist watch lists and enhanced its search capability with a "Google-like" function. Previously, the databases could not be quickly searched or cross-referenced. Authorities said that while the threat of homegrown terrorism remains acute, the capabilities of al Qaeda have been successfully degraded to "one of its weakest points in the past decade." "During the past two years, al Qaeda's base of operations in the Federally Administered Tribal Areas [of Pakistan] has been restricted considerably, limiting its freedom of movement and ability to operate," Leiter said. "The group has been forced to react continuously to personnel losses that are affecting the group's morale, command and control, and continuity of operations." +Out of Town on New Year's: Obama, Biden, Homeland Security Sec.